Do you ever watch a movie and you don’t know what to think? I actually shrugged in confusion after I finished watching The Promise. 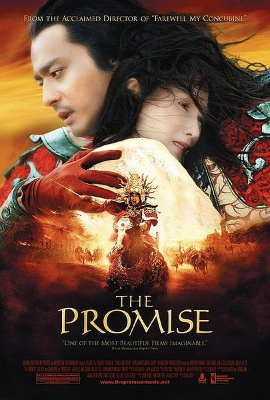 The Promise is the English title for 2005 epic Chinese called Wú Jí. It was nominated for a Golden Globe for Best Foreign Language film. I should note that I watched this in I guess the US version which is different from the original which is such BS but that is it. Ok so the plot, such as it is, goes a little like this. There is a staving girl named Qingchen, who steals from the dead but a boy catching her and wants her to be his slave. She lies that she will but hits him and runs off. She then meets a Goddess who offers her beauty, riches and luxury but she she will never find everlasting love. She accepts this deal. The only way to break this fate is for Time to flow backwards, for Snow to fall in spring and for the dead to come back to life. Flash-forward. General Guangming defeats a bunch of barbarians with slaves. One speedy slave catches his eye whose name is Kunlun. 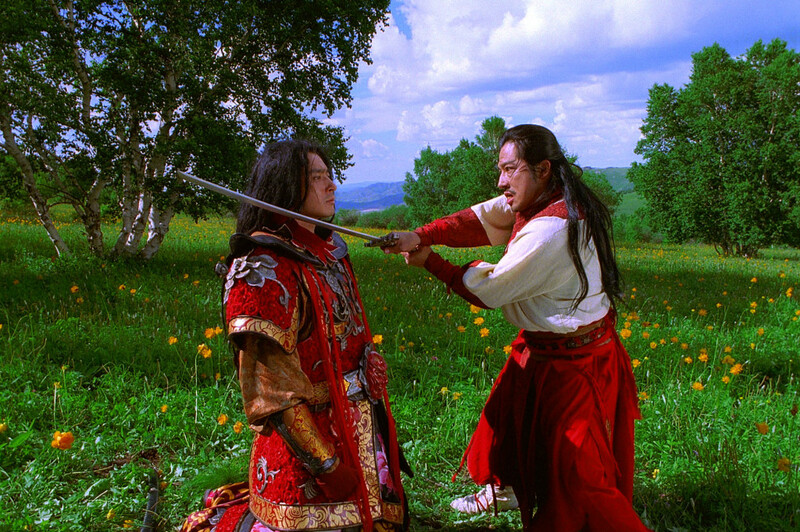 Kunlun loses his master in the battle so Guangming makes him his slave. Then King is in danger from an evil Duke names Wuhuan. As Guangming and Kunlun race to save the king they are attacked by some dude who wears a black feather cape, who is the Duke’s minion as well as super fast. Guangming gets injured so he has Kunlun puts on his armor to save the king. 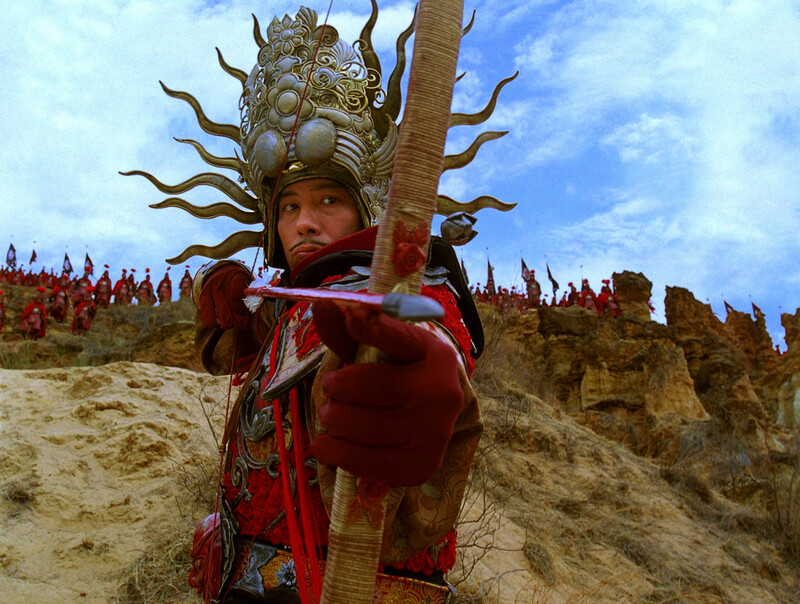 Guangming tells Kunlun that he will know the king because he will the only one unarmed. However Kunlun kills the King has the king was armed and he mistake Qingcheng, king’s concubine as the King because she wasn’t armed. 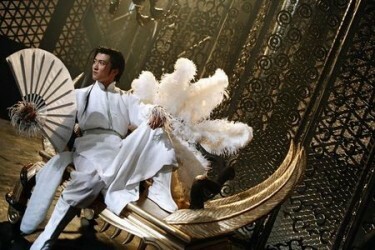 However Kunlun jumps off a waterfall and Qingcheng is taken by Wuhuan and put in a golden birdcage. Kunlun survives and him and Guangming decide to save Qingcheng because apparently Guangming and Kunlun are both is love with her now, I guess. Qingcheng falls in love with Guangming by mistake because she think he was the one that saved her but it was Kunlun. So they live together for awhile despite Qingcheng’s fate of never having a lasting love. Kunlun then learns from feather cape minion whose name is Snow Wolf, that he is from the Land of Snow. In the Land of Snow everyone can run SUPER fast but that didn’t help when Wuhuan came and killed everyone. Snow Wolf was scared of death so he opted to wear Wuhuan’s cape which keeps him alive. Then Guangming gets captured by Wuhuan. He puts him on trail for killing the king but Kunlun confessed that he did it with Qingcheng saying that she had a hand it in. She then realizes that Kunlun saved her and not Guangming. Wuhuan sentences them all to death and tells Qingcheng her that was the boy she tricked and it taught him not to trust anyone. There is a fight which ends with Guangming and Wuhuan killing each other and Kunlun fatally wounded. He puts on Snow Wolf’s cape (who took off in another scene and died) which grants him immortality which breaks Qingcheng’s fate. I just want to point out that the Netflix summary makes this movie seem way different. It makes it seem that Qingcheng has a more active role with a character arc but nope. This movie must of undergone several rewrites because I think there is an interesting story here with some interesting ideas but at some point it got lost. The plot is the most disjointed thing I have seen it a very long time. In a way it’s the opposite issue I have with some movie, the show don’t tell. This movie is all show to the point where there is no emotion despite emotions being necessary to the story. I don’t care about any of these people and when you “I don’t care about a movie like this it means the love story is dumb and the fight scenes are tension-less dance numbers. All the characters are bland. They have no personalities except Wuhuan who is just generically evil. I don’t understand his motivation for his coup, I found his mistrust of people comically simple. A little girl didn’t want to be his slave and stole the bread he stole from her? What? I get this movie opted for that Fairy Tale simplicity but that is an excuse for weak filmmaking. Speaking of the filmmaking, same of the technical work is great. This movie is all style and negative substance. The cinematography is lovely. The costumes are all very cool. And the fights/action part are mostly appealing. My favorite was the one with the bird screen, too bad there was no tension to give that fight any drama. It’s a very visually pleasing to look at, maybe as a silent movie it would have functioned better. However the CG effects were not that great, they boarded on silly. That could be because this movie is eleven years old and a lot the effects just didn’t age well. That would be forgivable if that story and character were interesting. On a technical level The Promise is pretty but the story and characters are so devoid of themselves that there is no emotional resonance. Also how did the super fast Snow people get capture by Wuhuan in the first place? That seems like it shouldn’t have been possible.